Okay, I'm the first to admit that my timing on writing blog subjects isn't always the best. 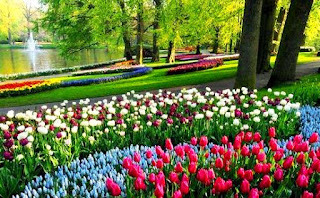 But in continuation of my list of recommended places to visit in The Netherlands, the now closed-for-the-season world-famous Keukenhof Gardens is in this week's spotlight. It boasts several awards for being the most valued attraction in Europe and the most-photographed place in the world. But mind you, this place is not just for flower power people. The park is only open for a few short months during the spring and it's a safe bet that anyone you know who's been to Holland between the months of March and May has probably visited it. If the words "horticulture exposition" don't make your motor run, don't worry--you're not alone. This is literally a place to have to see in person to believe, and is exactly what comes to mind when imagining the land of cheese, tulips and windmills. Personally, I'm a bit prejudiced towards tulips -- they just happen to be my favorite flower (I carried white tulips down the aisle in my wedding bouquet). But I can almost guarantee you haven't seen tulips like the ones growing at the Keukenhof. The park has more than just tulips, there are several varieties of other spring bulbs such as daffodils, hyacinths, and other lesser-known flowers. When you visit this place, prepare to be astonished and amazed. If you can imagine almost any color of the rainbow, there is a genetically-manipulated tulip to match it. Purple tulips? Check. Green tulips? Check, check. Black tulips? Yep, they got 'em. The creative swags of color wind their way through the park in one nonstop work of art. I have a sneaking hunch that each year the park board secretly hires a team of wannabe Disney Imagineers to come up with new ways of designing beautiful patches of color lifting the level of flower eye candy to new heights. The most amazing thing is that each year 4.5 million bulbs are planted in more than a hundred varieties. That's a lot of dirt under the fingernails.